Simple models of a small open economy yield strong results for the optimal taxation of capital located in that country. Given a world rate of return, a tax will raise the pre-tax rate of return, but leave the post-tax rate of return unaffected. The rise in the pre-tax rate of return is achieved by an outflow of capital which reduces labour productivity and hence the compensation received by the immobile domestic labour force. Although these effects may be moderated as the size of the economy rises, there is nevertheless a presumption that the burden of the tax will be shifted away from the owners of capital to the labour force. We test this proposition directly using a large database of 23,000 companies in 10 countries over the period 1993 to 2003. We allow for the effects described above, and also consider the impact of taxes in a rent sharing framework where the workforce bargains with the company over the allocation of location-specific rent. The results strongly support the hypothesis that source-based taxes on corporate income are passed on in the form of lower wages. We find sizable effects using two alternative models. The more moderate effects, found in both Model 1 and Model 2, suggest that just over half of an increase in tax liability would be passed on to the workforce in the short run. In the longer run, the fall in employee compensation would exceed the original increase in the tax liability. The effects found in Model 2 are even larger. There is also some evidence that for multinational companies, higher effective tax rates in other parts of the multinational group tend to have a positive effect on domestic wages. Given that tax liabilities are highly positively correlated with profit, and the wage rate is positively correlated with profit, the unconditional correlation between the wage rate and the tax liability per employee in the data is strongly positive. To identify the effects of tax on the wage rate it is therefore necessary to control adequately for other effects on wages, particularly through profit and productivity. This makes the large negative effects of taxation found here even more striking. Emphasis added. Corporate taxes are not a progressive measure. Corporate profits are not driving the increase in the top-fractile income shares. So how would higher corporate taxes reduce inequality? Reducing the GST is bad economics. Just ask anyone who has given any thought to the matter. Reducing the GST is bad - or at best, pointless - politics. Just ask voters. Now, I can understand that the Conservatives are in the business of cutting taxes. But the intelligent way of implementing that agenda involves cutting stupid taxes and keeping (or even increasing) smart taxes. Sadly, that doesn't seem to be the Conservative way of implementing this agenda. According to Table A.1 on this page, the GST cut accounts for over 60% of the reduction in taxes over the next five years. Stupid, stupid, et cetera. Okay, yes, they are accelerating the previously-announced rate at which the federal government would be reducing corporate taxes (Table A.2 from the same page), and that's a good thing. But it's not enough to dispel the odour of ideologically-driven amateurism. The Quebec government has just released a collection of studies on financing education, including this one (121-page pdf, in French) written by Valérie Vierstraete, a professor of economics at the Université de Sherbrooke. It addresses exactly the sort of questions that need to be asked and answered in this debate: what would happen to university enrollment if we increased/decreased/held constant tuition fees, and what are the implications for government finances? Plan to cut GST blasted: The Conservative government's plan to trim the GST for a second time has been soundly rejected as a top tax-cutting priority by a large group of economists surveyed by The Globe and Mail. All 20 economists said other tax cuts would be better for the country than trimming another percentage point from the goods and services tax, which represents more than $5-billion in revenue. It's a remarkable show of unanimity on public policy, given that the responses were from organizations as diverse as the Fraser Institute, the Canadian Auto Workers, Canadian Manufacturers & Exporters, Bank of Montreal and the Halifax-based Atlantic Institute for Market Studies. But the Harper government doesn't seem to upholding its end of the bargain by disavowing the measure. Worse, it seems likely to be passed, even though he has a minority and none of the other parties support the measure. "Stupid, stupid, stupid, stupid," he said. Stephen Harper has been exposed to training in economics, and he has a (by now, deserved) reputation as a political strategist. So why in the world is he pushing a policy that is bad economics and which will confer essentially no electoral advantage? Dani Rodrik's pessimistic post on the future of economics blogosphere - and his subsequent correction - left me a bit bemused. By my current reckoning - and I will be thrilled if someone can correct me - the Canadian economics blogosphere consists of two members: me and John Palmer at Eclecticon. A Canadian Econoview seems to have - to my great distress - gone dark. And while I welcome and strongly encourage students such as Stackelberg Follower (again, if there are any others, I'd be more than pleased to learn about what I've been missing), they run the very real risk of having better things to do with their time than blog - like writing a thesis and getting tenure. So before I start worrying about people leaving the economics blogosphere, I'd like to see more people from this side of the border entering it. 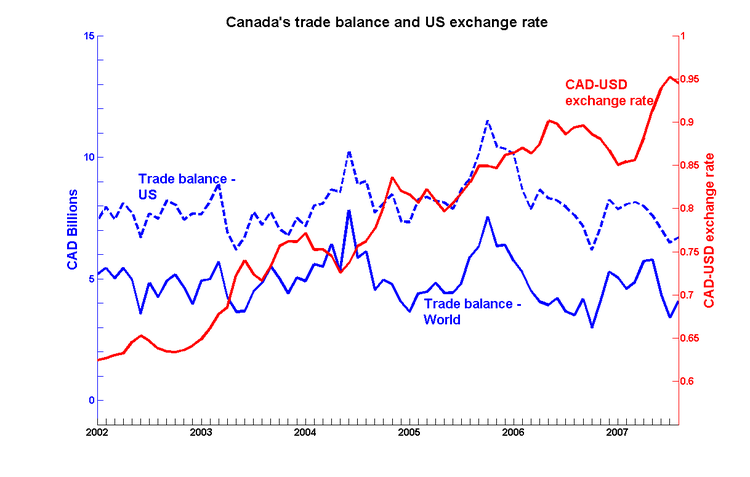 Even if we apply the usual factor-of-ten rule for US-Canada comparisons, two is far too small a number compared to that of US economics bloggers. It's even too small compared to the number of economics bloggers in Australia, which has two-thirds the population of Canada. The Canadian economics community is pretty small, so academic and public-sector economists know each other fairly well. Government economists are people we've met at conferences, people we've gone to graduate school with, or (more and more frequently for me) people we've had as students. We don't need to mount a public relations campaign in order to get a sympathetic hearing at the Department of Finance or the Bank of Canada. Update: Wishes do come true! Not long after I posted this, Underground Economics popped up. Now I wish I someone would give me $100m. And a pony. 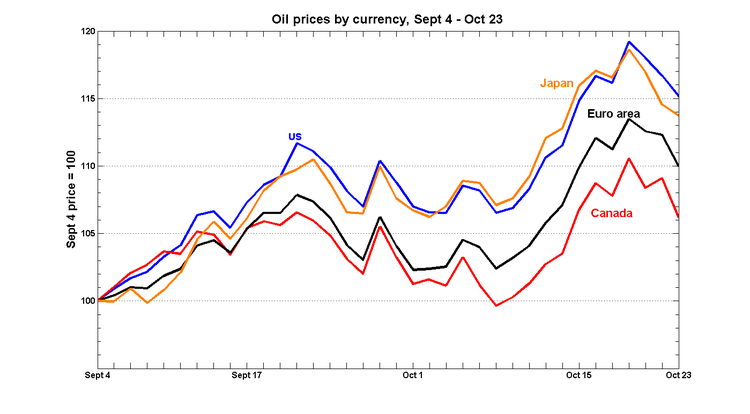 As predicted, the Bank of Canada decided to keep its overnight target at 4.5% on Tuesday. That's twice now that the Bank has put off applying the tightening it started in July, and it looks as though this temporary pause has now been upgraded to a medium-term strategy. The October Monetary Policy Report (32-page pdf) outlines the combination of tighter liquidity in financial markets and the worse-than-previously-expected outlook for the US economy behind the move. It occurs to me that I've spent a lot of time recently blogging about the Bank of Canada. Now that they've committed themselves to doing not very much for the next few months, I'll try to find other things to write about. That's twice in a row that a governor has been an external candidate - although he has worked there before. I suspect that Bank employees who are thinking about the top job will start sending their CVs to the Department of Finance or perhaps the IMF. The Prime Minister announced today that Tiff Macklem, Deputy Governor of the Bank of Canada, has been appointed Associate Deputy Minister of Finance, effective 1 November. Mr. Macklem will also serve as Canada's Finance Deputy at the G-7, G-20, and the Financial Stability Forum. Mr. Macklem will replace Mark Carney in these roles. Mr. Carney was recently appointed the next Governor of the Bank of Canada, effective 1 February 2008 and is joining the Bank of Canada as an Adviser to the Governor effective 1 November. Tiff was in fact the person I had in mind when I wrote those lines: like Mark Carney (and unlike Paul Jenkins), he has a PhD, and (unlike Mark Carney) he also has kept in touch with academia (his article 'Aggregate wealth in Canada' is one of my favorite pieces of applied work). He's done everything that could have been expected of him, and done it very well; it would be a very bad signal to younger staffers if that particular career path turned out to be a dead end. The next question is: who will be the next Senior Deputy Governor at the Bank of Canada? And - more pointedly - why would he or she accept the job? 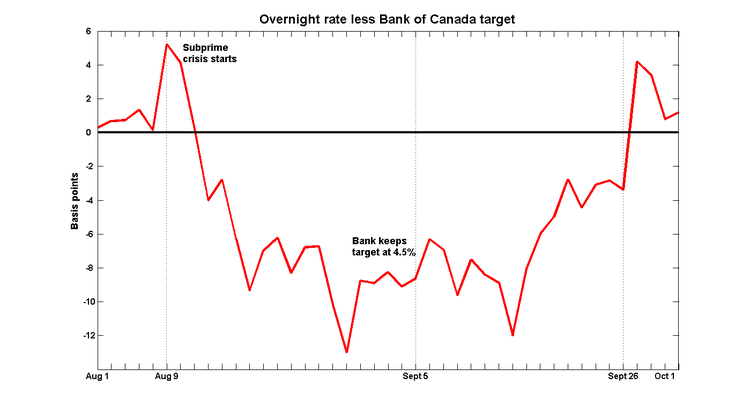 On the one hand, the Bank of Canada has had to intervene repeatedly in the overnight market to defend its target. (It has also added liquidity in the the two days since that post: $495m yesterday and again $420m today.) And the spread between the overnight rate and that of short-term paper is still well above what it was a couple of months ago. On the other hand, there was good news in the August building permits release, and September's unemployment rate fell yet again to yet another 30-something-year low. Moreover, the news from the US isn't uniformly bad. Put those two conflicting messages together, and it looks more and more as though the Bank will hold interest rates steady on October 16. Especially since the ECB and the Bank of England have just made that decision, in similar circumstances. That's twice in a row that a governor has been an external candidate - although he has worked there before. I suspect that Bank employees who are thinking about the top job will start sending their CVs to the Department of Finance or perhaps the IMF. The days of appointing a governor from within the ranks appear to be over. It's also interesting that his background appears to be more in finance than in monetary economics. This probably reflects the problems the Bank will be facing in the next few months. Its monetary policy hasn't changed since John Crow's time, and there's little obvious need to revisit the basic policy: inflation has been low and stable for 15 years. It's time to focus more attention on financial markets. What is going on in the overnight market? The Bank of Canada has intervened in the overnight market for four days in a row now: $985m on Thursday, $1.087b on Friday, $890m Monday, and another $855m yesterday. Update: Make it five in a row - another $520m today. Third BOC injection in three days reveals 'clog in the system': Something is definitely amiss in Canada's money markets. The Bank of Canada, for the third business day in a row, injected about $1-billion into the overnight market to defend its key interest rate. "The end of September is quarter-end for a number of foreign financial institutions, and technical upward pressure on the overnight rate is not uncommon at both month-end and quarter-end," explained bank spokesman Jeremy Harrison. But something happened last Thursday: the overnight rate jumped 8 basis points, and would have gone higher if the Bank hadn't kicked in that $985m. Since then, the Bank has had to work hard to keep it near the target. In an e-mail, Heather Scoffield says "The bank tells me the overnight rate floated up continually above 4.50, by about six to 10 points each day, until intervention pulled the rate back down to target." The end-of-quarter cash-flow story is a plausible one, but it's hard to see why that would require intervening two days into October. My guess is that the Bank is doing its best to play down any possible expectations of an interest cut on October 16. If the Bank were to acknowledge that financial markets were in a deeper mess than it had previously thought, then people would start working under the assumption of a rate cut. But it should be remembered that before the subprime crisis hit, the Bank was in the middle of a cycle of interest rate hikes. If things settle down fairly soon, then it would be obliged to reverse a rate cut pretty quickly. The Bank doesn't want to be an additional source of volatility for financial markets, so if it does cut interest rates, it will be because things are looking very bad indeed. The other thing these books have in common is a complete absence of anything that looks like the kind of international trade theory that academic economists teach. I don't mean that these authors challenge the economist's view. I mean that they write as if it did not exist. It is important to be clear about the completeness with which academic economics is ignored. It is not a matter of a lack of familiarity with the latest wrinkles in research. Rather, nothing of international trade theory as economists know it ... is in these books.